Late last year I wrote how kitchen work station lighting can add safety as well as convenience. Anywhere in your home where cabinets overhang counter-tops and sinks often means unwanted shadows. In the kitchen, if you're simply storing appliances under the cabinets, the shadows may not prove an inconvenience. But if you're preparing food-especially handling knives and slicers-an under-counter lighting system can save you more than time. But let's talk about the great cosmetic effect of under-counter lighting. You can install some lighting sets in under an hour and they really accentuate the colors and textures of your counter-tops. Under-counter lighting sets are made to fit inside the recessed area under the cabinets (roughly just under an inch deep), hiding the fixtures while providing ample room for light to stream down without shadows. 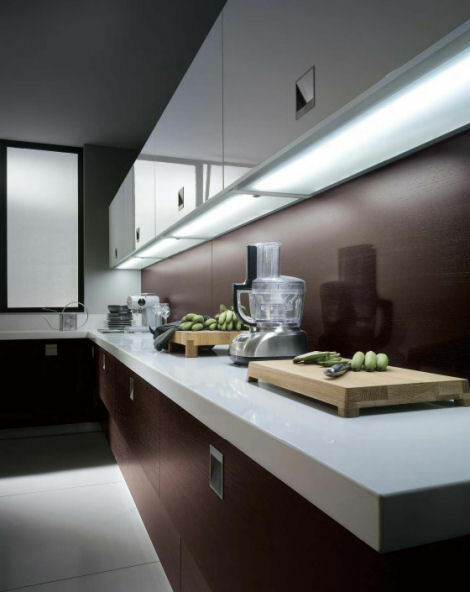 Kitchen lighting comes in a variety of voltage offerings. On the efficient end, the lights can operate on as little as 12 volts. You need to install a transformer if you want to convert your 120-volt wiring to power the set. Be sure to check with the manufacturer or retailer to ensure that the light set wiring is designed for the load. You also need to install a transformer to handle the lighting load. Speak with your electrical contractor or light set retailer. You can select lighting sets with the right number of lights to serve the space. As a rule of thumb, locate a lamp every three feet and aim them at the work surface or counter-top where you want it most. Newer model under-counter sets include LED lights, an energy efficient alternative to traditional bulbs and fixtures. If you're remodeling, it's the perfect time to pre-wire your replacement cabinet sets and surfaces for under-counter lighting. Brighten up! This entry was posted on Wednesday, January 20th, 2010 at 11:01 am and is filed under Electrical , Remodeling , Kitchens , General Remodeling . You can follow any responses to this entry through the RSS 2.0 feed.